Here's the cover to my book. You can also see it here on the Simon & Schuster website. Another first: I actually have a working summary of the book. ONE BOY. UNTOLD ENEMIES. A WHOLE WORLD TO SAVE. TIME IS RUNNING OUT. Eleven years ago, a shattered band of ancient hunters captured an unimaginable evil and Phineas T. Pimiscule rescued his nephew, Sky, from the wreckage of that great battle. For eleven years, Sky Weathers has studied traps, puzzles, science, and the secret lore of the Hunters of Legend, believing it all a game. For eleven years, Sky and his family have hidden from dark enemies while, unbeknownst to Sky, his uncle Phineas sacrificed everything to protect them. For eleven years, Sky Weathers has known nothing of that day. 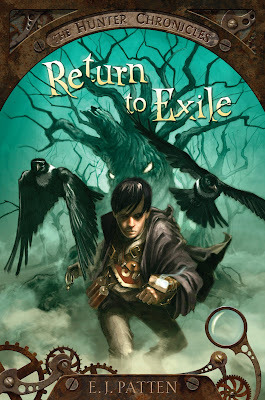 But on the eve of Sky's twelfth birthday and his family's long-awaited return to Exile, everything changes. Phineas has disappeared, and Sky finds himself forced to confront the mysterious secrets he's denied for so long: why did his family leave Exile on that day so long ago? What, exactly, has Phineas been preparing him for? And, the biggest mystery of all, who is Sky really and why does everyone want to kill him?! Duck, the kid's gonna punch you! Very exciting, Eric, keep it up!